Curry Ground Beef Stroganoff is a simple, quick, and super flavorful dinner idea that your whole family will love. This post is sponsored by Reames® and SheKnows Media. This Curry Ground Beef Stroganoff is a mash up of two of my very favorite recipes – ground beef stroganoff and our cabbage curry. 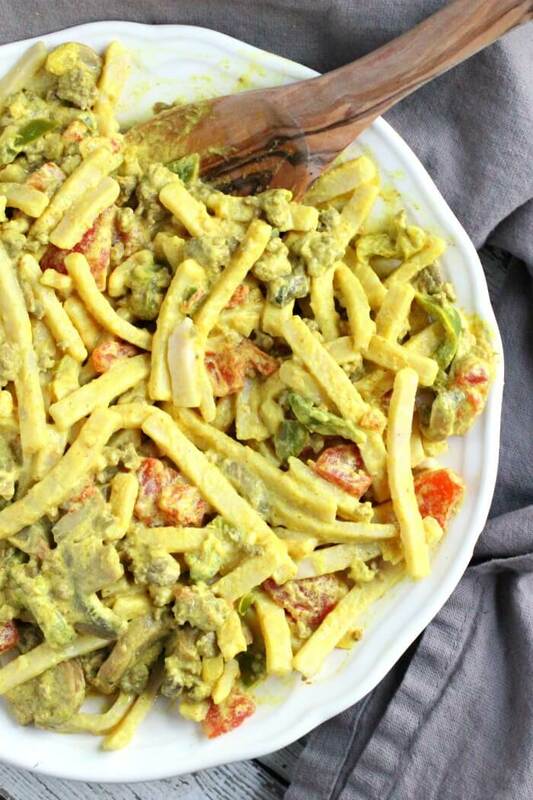 My kids love it because it tastes great but also because it’s a fun super bright yellow! Serve Curry Ground Beef Stroganoff with roasted carrots, and finish the meal with a quick lemon mousse (to keep up the yellow theme, of course!). Sour cream – I like a good full fat sour cream for this recipe, but if you’re counting calories low fat will work too. Don’t use fat free though as it will give the recipe a grainy texture. Minced garlic – You can totally mince your own garlic, but if you want to make it easy on yourself, it’s okay to use pre-chopped! Sweet bell pepper – I like to keep a bag of chopped sweet peppers in my freezer for just such occasions like this. The recipe comes together so quickly if you don’t have much time in the evening! If you’re not rushed for time then go ahead and use fresh produce. Onion – I also keep a bag of frozen chopped sweet onion in the freezer. This recipe works well with both white onion and sweet onion. I prefer not to use red as it muddies the color. Tomatoes – Canned tomatoes work great in this recipe. I like the petite diced ones. Again if you’re looking to spend more time in the kitchen, then fresh tomatoes are great as well! Mushrooms – I’m sure you see a theme here, but a can of mushrooms or frozen mushrooms are perfect for this curry recipe. You’re always welcome to use fresh. 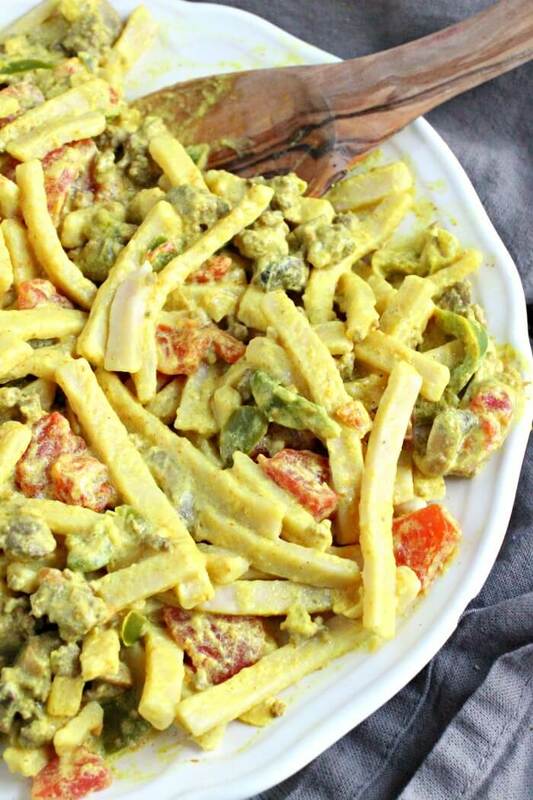 Yellow curry powder – Yellow curry powder is a flavor often found in the Caribbean islands and is heavily inspired by Indian curry. It is incredibly flavorful and very delicious. It is not spicy unless you specifically purchase a spicy curry powder. Ground beef – Any type of ground beef is fine – you could even mix it up with ground chicken, turkey, or even lamb! Make sure to drain off any excess fat before adding it to this recipe. 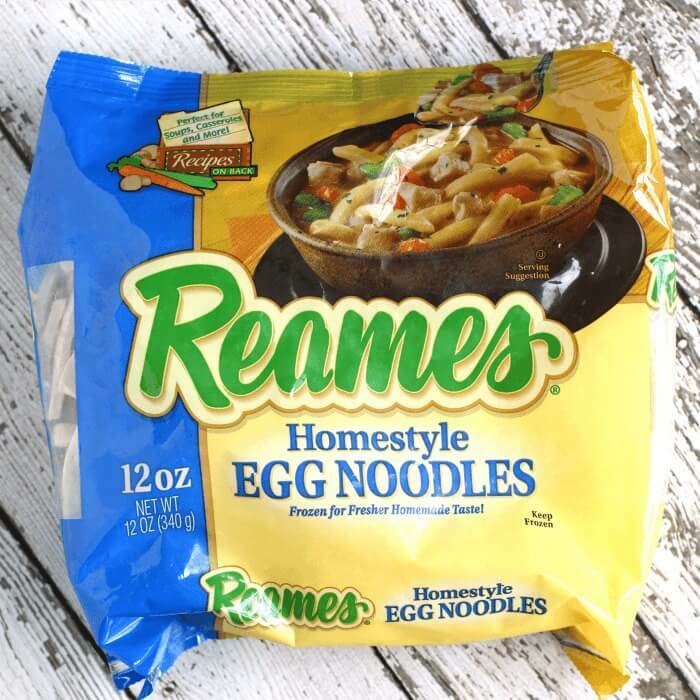 Egg noodles – We used Reames Homestyle Egg Noodles, one of the many types of Reames Frozen Egg Noodles (which can be found in the freezer section of your local market). They come in generous packages (I used the 12 oz. bag in this recipe) and will be ready in only 20 minutes. 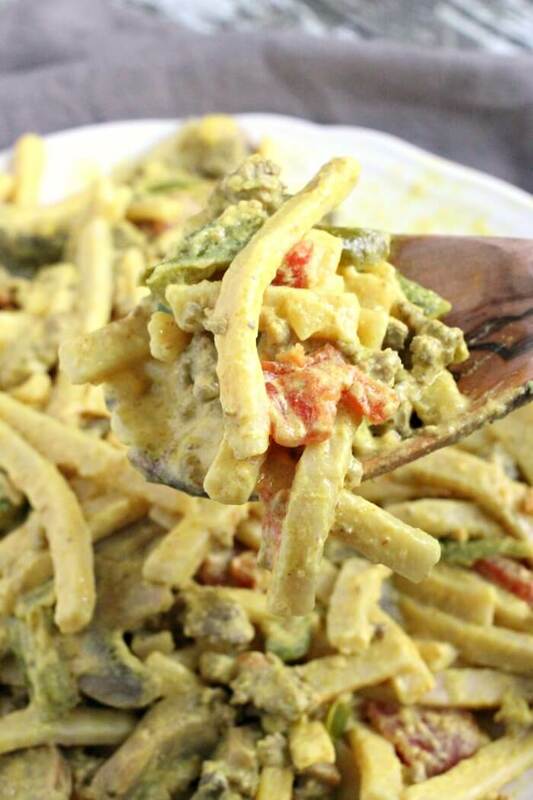 Reames Frozen Egg Noodles are the perfect addition to our Curry Ground Beef Stroganoff because they’re convenient to make since they’re frozen but my family can still enjoy a homemade taste. They are incredibly delicious, with a thick hearty texture that tastes just like the egg noodles you can make from scratch. They also only contain three ingredients (flour, water and eggs), are never dried, and contain no preservatives! Can you think of anything better? I sure can’t! Find your closest retailer here! First, in a large skillet, whisk together sour cream, garlic, pepper, onion, tomatoes, mushrooms and curry powder. Next, bring ingredients to a simmer and cook on medium heat until everything is well combined and heated through. Then, stir in cooked ground beef, and add prepared prepared Reames Frozen Egg Noodles. Mix well. 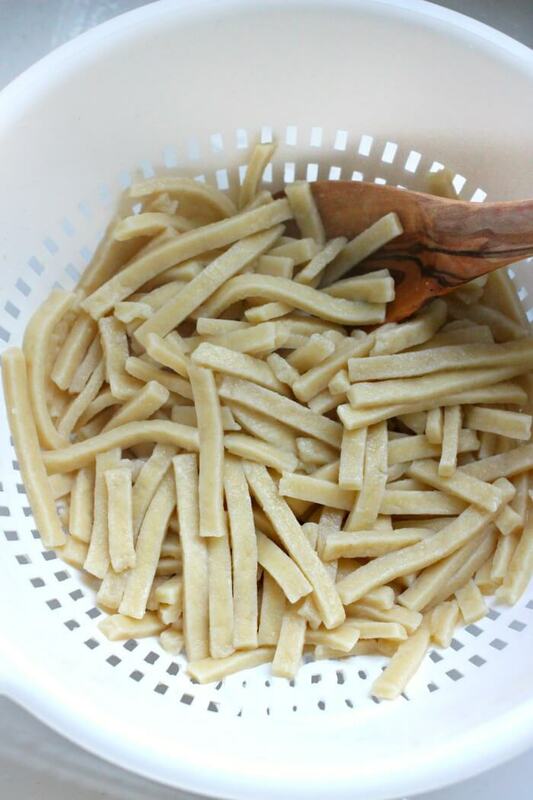 Egg noodles are great in a variety of recipes (although if we’re being honest, my kids would be perfectly happy eating them with a little butter and salt!). We keep a few bags of Reames Frozen Egg Noodles in the freezer so we can make these dishes any time! Our Curry Ground Beef Stroganoff is truly a full meal in itself with the meat, veggies, and Reames Frozen Egg Noodles, but if you want to pair it with more dishes or a simple dessert, here are some great ideas! Large deep skillet – I like to use my 15 inch cast iron skillet so I know there’s plenty of room, but a 12 in skillet will work too, just make sure it has high sides. Medium/Large pot – Big enough to boil water and cook the egg noodles. Spatula – Something to stir your noodles, I’m a huge fan of wooden spatulas and wooden spoons. Prepare egg noodles per package directions. While egg noodles are cooking, in a large skillet (at least 12 inches, but I prefer my 15 inch), whisk together sour cream, garlic, pepper, onion, tomatoes, mushrooms and curry powder. Bring to a simmer and cook on medium heat for 3 - 5 minutes until everything is well combined and heated through. Stir in cooked ground beef, then stir in prepared egg noodles. 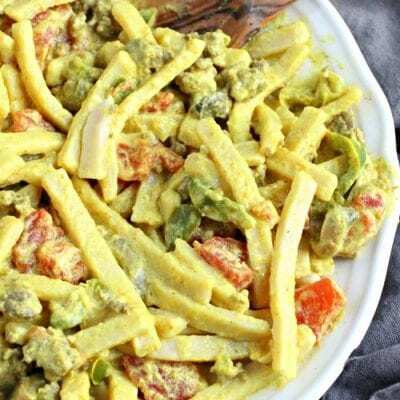 You can use frozen veggies in this recipe, just make sure you measure while they are frozen, not after they are thawed. I like to keep a bag of frozen diced onions and frozen diced peppers on hand. 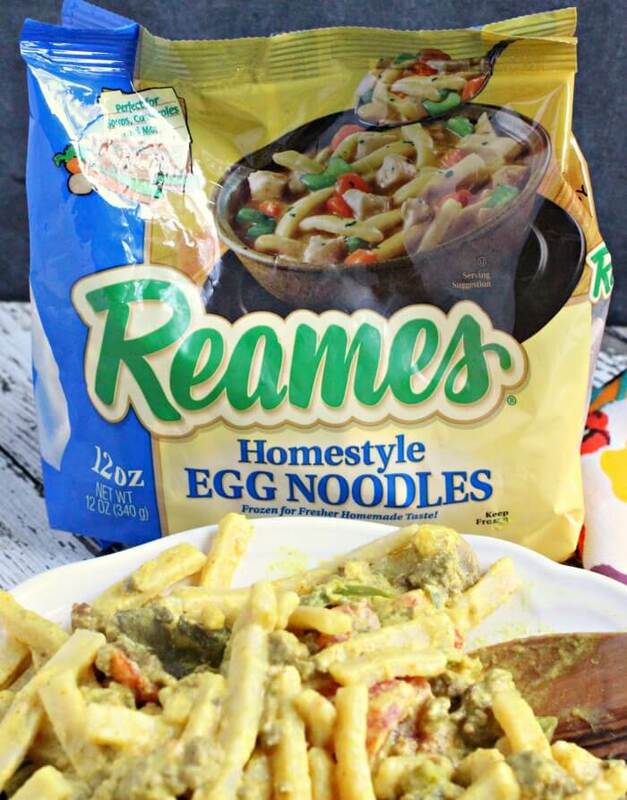 We used a 12 ounce bag of Reames Frozen Egg Noodles in our recipe for the taste of homemade with none of the hassle! These noodles are going on my shopping list! This looks amazing!!! April, what can we use instead of Curry….no one here cares for curry. It looks delicious but we don’t do curry anything. Thanks. 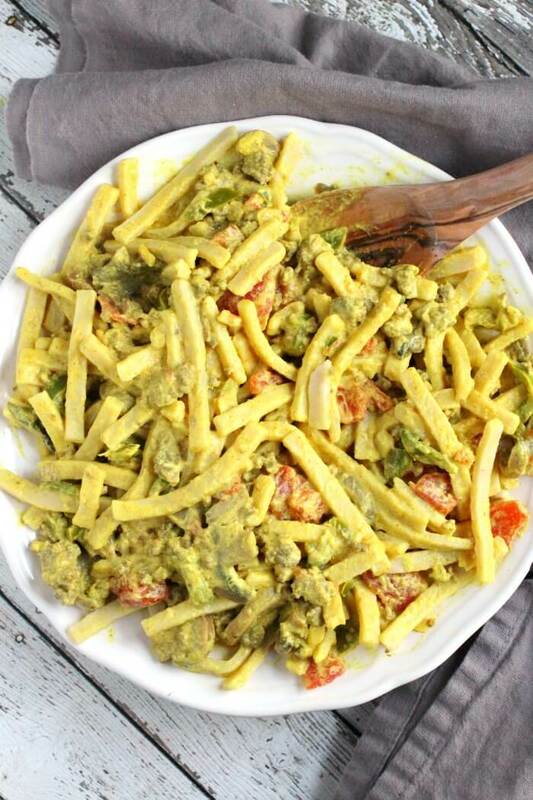 I love the curry twist on this classic recipe. 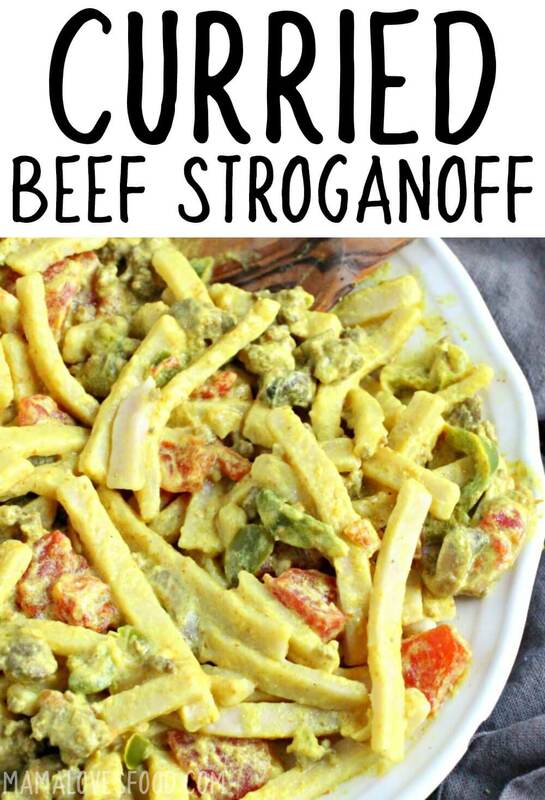 Totally a delicious twist on beef stroganoff!